Master Carvelle: This is a community of people feeling the same thing. Most of them, strangers. But you are uniting them. You are giving them your voice. And that's as spiritual as it gets. This movie, released in 2015, had a brief run recently at Princeton's nonprofit movie theater. 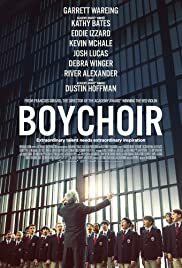 It's the story of the fictional "National Boychoir School" and features the singing of students from the local, real-life American Boychoir School. ABS has fallen on hard financial times, and if it needed an infomercial to stimulate a really big donation, this is it. The movie stars Dustin Hoffman, Kathy Bates, Debra Winger, and Eddie Izzard in the adult roles, but director François Girard and writer Ben Ripley demand little of their talents. The story dwells mostly on the boys, and one particular boy (Garrett Wareing)—a misfit who arrives at the school unable even to read music, yet such a vocal prodigy that . . . yes, you can guess the rest. When the credits rolled and it turned out the movie had some affiliation with the Hallmark Hall of Fame, that was one of the least surprising moments in a string of non-surprises. Leaving aside its dramatic shortcomings, the creators' generosity with the music lifts the whole production. Actual ABS students are used in the production, according to a local news story, and director Girard said of the school, "It was extraordinary to see them at work. What they accomplish goes way beyond music." A good movie for kids and a pleasant, if unchallenging interlude for grownups, too.